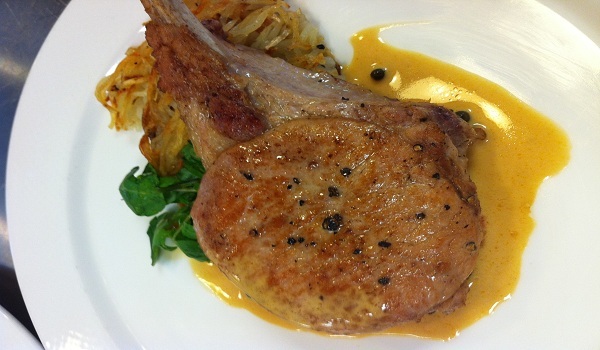 Consomme Pork Chops is excellent for a special occassion. Learn how to make/prepare Consomme Pork Chops by following this easy recipe. In a skillet heat the oil. In a shallow dish place the flour. Sprinkle the pork chops with salt and pepper and press it onto the flour to coat it lightly. Now cook the chops in the skillet until lightly brown and then drain. Mix the rice, consommé, and water in a baking dish. Place the onion slices over the rice and then top it with the pork chops. In a preheated oven bake the chops at 175 degrees C for 1 ½ hours until the rice and pork are tender and done.